2. pertaining to the ostium cardiacum. cardiac arrest sudden and often unexpected stoppage of effective heart action. Either the periodic impulses that trigger the coordinated heart muscle contractions cease or ventricular fibrillation or flutter occurs in which the individual muscle fibers have a rapid irregular twitching. The majority of victims of cardiac arrest suffer from ventricular fibrillation, and most have severe coronary artery disease. The only chance for survival for many who have unexpected cardiac arrest is successful implementation of emergency cardiac care and cardiopulmonary resuscitation (CPR). Reduction of the incidence of cardiac arrest and sudden death is a major concern of the American Heart Association and the American Red Cross. Programs aimed at achieving the goal of reduced mortality from cardiac arrest include education of the general public in ways to avoid the development of coronary artery disease in the first place, and secondarily, training lay people and health care professionals and paraprofessionals in the techniques of CPR and emergency cardiac care. Although cardiac arrest usually is related to preexisting coronary artery disease, there are other events in which the prompt delivery of CPR alone could mean survival for the victim. These include the cessation of heart and lung action as a result of drowning, suffocation, electrocution, drug overdose, and severe accidental trauma. cardiac catheterization the insertion of a catheter into a vein or artery and guiding of it into the interior of the heart for purposes of measuring cardiac output, determining the oxygen content of blood in the heart chambers, and evaluating the structural components of the heart. It is indicated whenever it is necessary to establish a precise and definite diagnosis in order to determine whether heart surgery is necessary and to plan the surgical approach. A, Right-sided heart catheterization. 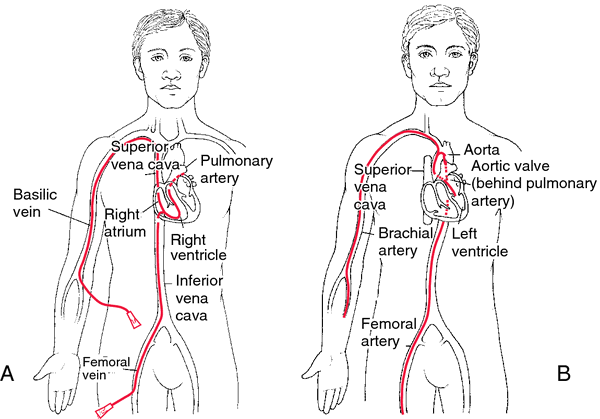 The catheter is inserted into the femoral vein and advanced through the inferior vena cava (or, if into an antecubital or basilic vein, through the superior vena cava), right atrium, and right ventricle and into the pulmonary artery. B, Left-sided heart catheterization. The catheter is inserted into the femoral artery or the antecubital artery. The catheter is passed through the ascending aorta, through the aortic valve, and into the left ventricle. From Ignatavicius and Workman, 2002. Patient Care. Patients scheduled for cardiac catheterization experience a high level of stress. They are fearful and anxious because the procedure involves the heart, has a potential for some rather serious complications, and could indicate a need for cardiac surgery. Prior to the catheterization the patient will need to know that it is not a surgical procedure, even though a consent form must be signed, food and fluids are restricted, and a surgical preparation of the catheter insertion site is done. The patient should be told of these and other preparations as well as the physical features of the laboratory in which the catheterization is to be done. During the initial assessment it is important to find out whether the patient has any allergies. The contrast medium used contains iodide salts; if a patient is allergic to iodine or seafood, a contrast medium that does not contain iodine must be used, or antihistamines must be administered before the procedure. A mild tranquilizer or hypnotic may be given just before the procedure to help the patient relax, but a general anesthetic is not used. Patients need to know that they must be awake and cooperative during the procedure. They will be asked to stay in a certain position, cough, breathe deeply, and possibly exercise so that the heart's response to an increased workload can be evaluated. They should be reassured that the laboratory staff is ready and equipped to handle any emergency should the need arise. Ideally, preprocedure visits by the physician and a member of the staff in the cardiac catheterization laboratory will provide patients with the information they need about the procedure, its purpose, and potential complications. However, because of anxiety the patient may not be able to assimilate the information and will have many questions not asked at the time of the visits. It is then the responsibility of the floor nurses to answer questions as honestly as they can and to provide emotional support and reassurance. After the procedure the vital signs are checked periodically. It is especially important to check the pulses distal to the insertion site every half-hour for three hours, or as often as required by protocol, to be sure there has been no clotting and obstruction of a blood vessel. The insertion site dressing is changed as needed and the site inspected for signs of infection. Thirst and diuresis are expected because of the effect of the dye used in the procedure. The patient should be encouraged to drink fluids to prevent hypotension and hasten excretion of the dye, which is potentially nephrotoxic. Mild discomfort also is expected and should respond to the prescribed analgesic. If the patient experiences severe pain the physician should be notified. 2. Pertaining to the esophageal opening of the stomach. 3. (Obsolete). A remedy for heart disease. 2. pertaining to the cardia. 1. Of, near, or relating to the heart: cardiac arteries. See Usage Note at coronary. 2. Of or relating to the cardia. A person with a heart disorder. 1 pertaining to the heart. 2 pertaining to a person with heart disease. 3 pertaining to the part of the stomach closest to the esophagus. 2. Cardia, a part of the stomach, see there. of or relating to the heart. adj pertaining to or stimulating the heart. 2. Pertaining to esophageal opening of stomach. adj relating to the heart. n a stopping of heart action; a complete cessation of heart function.